( Internal space/punctuation counts as a letter) andare embroidered once. The font will be capital (upper case) lettering and the thread is top quality high visibility. Colour of webbing. 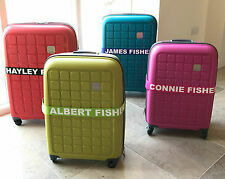 High Visible & Easy Luggage Identification. Strong Webbing. This is a ADJUSTABLE WEBBING BELT 20mm ( 3/4" ) (Quick release Buckle)These are made from plastic and are light duty.They are quick and easy thumb release. "Tell me the length of strap you want. If you are going to use it as a belt, please add at least 6 inches to your waist measurement to allow sufficient strap passing through the buckle. "These are any colour you would like and any size you like* *Please state when you pay with pay-pal your colour and size . If you don't say i will do it in Black and 40". Red , Black, Light Blue and White. This is more sizes we do For help and advice please contact us . I can include letters, numbers, common punctuation, etc. This is not cheap cotton print that easily wears but embroidery of the highest quality. The details can be upto 13 characters long in upper case. Light-weight: put away in bag or pocket or just buckle on your luggage. Adjustable strap with quick release buckle clip. 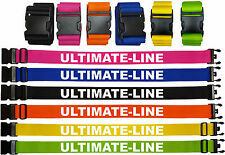 Material: polypropylene webbing and buckle. Quick Release Clip. The rucksack chest strap is made from strong and durable nylon, both portable and light weight and easy to wipe clean. May not be suitable for smaller children. The Sternum Strap length is adjustable from 10cm (4”) at its tightest to 60cm (23.5”) when fully extended, with a strap width of 2.5cm (1”). 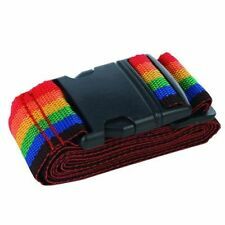 Multicolour Luggage Strap with LOCK. Luggage Strap. Trendy and Firm. 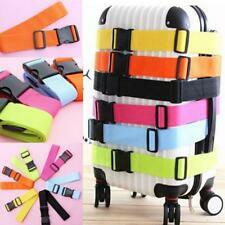 1 x Luggage Suitcase Cross Strap. Prevent your luggage from popping open. Durable, hard-wearing, extra security for your luggage. Fit for 32" luggage at most. Color: As the picture shows. Dish Drainer. Large Plastic Dish Drainer Drip Tray Plate Cutlery RackBuy Now. This Combination Luggage Strap features a triple combination lock on the opening clasp. Health & Beauty. 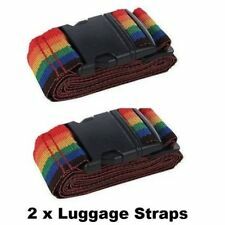 2 Pieces Luggage Strap. Elasticated Bungee Bunjee Cords Bungee Staps Strong With Metal Hooks . 3.5 out of 5 stars - Elasticated Bungee Bunjee Cords Bungee Staps Strong With Metal Hooks . 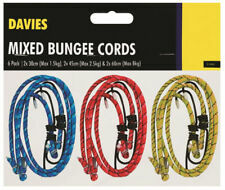 164 product ratings164 product ratings - Elasticated Bungee Bunjee Cords Bungee Staps Strong With Metal Hooks . Strong Webbing Gives Extra Safety to Your Luggage. Easy Luggage Identification. Universal Replacement Colombian Leather Shoulder Bag,Luggage Strap.54" L x 3/4"
US seller Travel Bag Suitcase Baggage Bag Strap Belt Plastic Clasp 66" x 1.5"
Samsonite Wide Luggage Strap / Belt - Adjustable to 72"
Universal Replacement Canvas Shoulder Bag, Luggage Strap.Brown.40" L X 1.5"
Replacement Luggage Messenger Hand Bag Leather Shoulder Strap Sling Brown 44x1"
Keep your luggage safe and secure with luggage straps, from plain and simple to bright and colourful styles. A zip or clasp doesn't necessarily guarantee that your suitcase will stay closed, so luggage straps give you extra protection on the go. Luggage straps are made from durable materials so that they can endure travelling. They generally come in buckle or bungee designs to secure them to your bag. The most common type of buckle used is the style that needs to be pinched on each side to release the catch. These are ideal as they are easy to open but won't open themselves if the bag is thrown about. If you want a bit of extra security against theft, find a strap that has a combination lock attached. Bungee straps are made from thick elastic to secure closely to your suitcase. They then fasten with two interlocking metal hooks to keep them securely in place. As well as keeping your suitcase safely closed, luggage straps have a range of other uses. 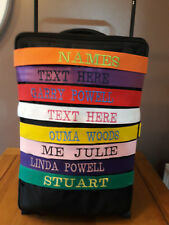 Choose a bright and colourful strap to give your suitcase an identifying factor when hundreds of black, grey and navy bags are going around the conveyor belt. You can also use luggage straps to tie two bags together to make it easier for you to move more than one suitcase or bag around with you. You can use normal luggage straps for this or look for 'add a bag' straps that hook around a top bag and secure it to the main suitcase's handle, making them easier to carry together. As well as traditional luggage straps, you can also find shoulder straps. These clip onto bags and suitcase so that you can carry them on your shoulder. You can use these as replacement straps or clip them onto a bag that doesn't have a shoulder strap to make it easier to carry.